Maisy Mouse is ready for bed. Following her normal bedtime ritual, she changes into her pajamas, brushes her teeth, and visits the potty. Both she and her bedtime companion, Panda, follow this evening ritual together before Maisy goes to sleep. The charming simplicity of this book makes it special. Maisy is drawn in black lines, the way a child might, with color filled in. The text is also written in bold, black ink. And the plain primary and secondary colors are soothing and not too busy for a small child to look at just before going to sleep. The unique Story Time Bundle packaging makes Maisy’s Bedtime even more enjoyable for children as they retire for the evening. It includes a crib size 36”x48” quilt, printed with a picture of Maisy cuddled with Panda in bed. A smaller, matching 24”x24” quilt can be used to tuck in a bedtime companion like Panda. 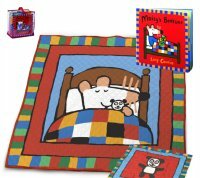 This quilt set and book is a delightful gift for any child who would like to make bedtime more special.